With the crew of Below Deck operating at about the least amount of dysfunction that we’ve seen yet this season. 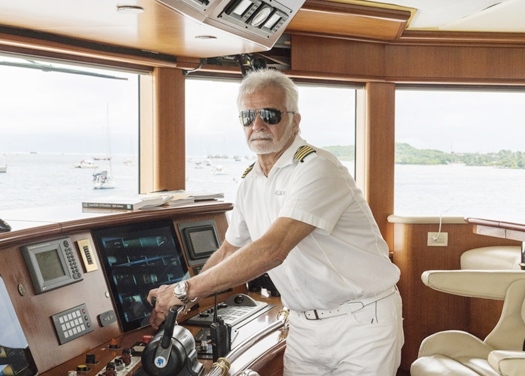 Captain Lee Rosbach devoted more of his blog to relationship and life advice. So he had less to say to Kate Chastain, Josiah Carter, and Ross Inia this week. This trio keeps it professional on the boat for sure. Tyler may or may not care about the proverbial dark clouds. It seems he has the same level of enthusiasm for Rhylee as he does a fresh jar of peanut butter. Though he really seems excited about peanut butter. TELL US- DO YOU AGREE OR DISAGREE WITH CAPTAIN LEE ROSBACH? HAS YOUR OPINION OF ANY CREW MEMBER CHANGED THIS EPISODE?